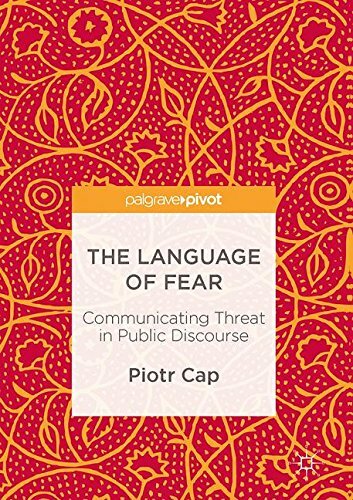 This book investigates linguistic strategies of threat construction and fear generation in contemporary public communication, including state political discourse as well as non-governmental, media and institutional discourses. It describes the ways in which the construction of closeness and remoteness can be manipulated in the public sphere and bound up with fear, security and conflict. Featuring a series of case studies in different domains, from presidential speeches to environmental discourse, it demonstrates how political and organizational leaders enforce the imminence of an outside threat to claim legitimization of preventive policies. It reveals that the best legitimization effects are obtained by discursively constructed fear appeals, which ensure quick social mobilization. The scope of the book is of immediate concern in the modern globalized era where borders and distance dissolve and are re-imagined. It will appeal to students and researchers in linguistics, discourse analysis, media communication as well as social and political sciences.